We finally had a gorgeous day outside today! It was pretty cold this morning--37 degrees--but it wasn't raining and the sun was shining. Eli was so funny this morning. He told me that he couldn't sleep because he was so worried that he was going to miss the bus today; he had a field trip, and was REALLY excited about it. His teacher had stressed to the class that they need to be on time, because the buses for the field trip leave right after school starts, so Eli was worried he'd be late and not get to go. He was ready for school by 6:30, and the bus doesn't even come until around 8:00. I took the kids to the bus stop, then came home and had breakfast before getting ready for my run. I am going to go back to doing my long runs on Fridays instead of Sundays. It works out better (at least while the kids are in school) for me to get away; and since I'm not going to be doing Hansons', the order of my runs really doesn't matter so much. I wanted to try a different route today, just to from getting bored. So I plotted an out-and-back run on a new connector path that was completed last year. I was really excited when I learned that they built this connector path! It links the Metropark that I usually run to three other Metroparks. Until they connected it, there was a section of about two miles that wasn't joined, and that always bothered me. It's now about 22 miles (one way) of paved bike path, and it's a great place to run! I parked at Huroc Park, which is about 9 miles in to the 22-mile long path. I've only been to Huroc Park a couple of times, but one memory still haunts me. Jerry will never let me forget it! When we had just started dating (May 1999), we went rollerblading at Huroc Park. The park is on a little island in the middle of a river, so it's just one loop of about 0.6 miles. The river comes up very close to the path, and at one point in the path (where the green marker is on the picture), there is a slight downhill, and then a sharp left turn--if you miss that turn, then you'd go right into the river. I was not good at stopping myself on the rollerblades, and when I noticed that downhill section taking me right to the river, I panicked. I knew I wasn't going to be able to make the turn with my rollerblades, so instead of attempting it, I just decided to wipe out on the grass. Jerry was behind me, and said it was hilarious to see me wipe out for no apparent reason. Fear of going into the river was reason enough for me! Anyway, I parked at Huroc Park, and then started running. About a quarter mile in, I realized that I hadn't actually entered the park, so I had to turn around and then cross a bridge to enter the park. When I started the path, I had already run 0.4 miles because of the mistake. Once I got to the new connector path (that's the green line running to the west on the above photo), I saw a map of the path. I hadn't seen this online anywhere, so it was nice to see the whole thing laid out. I usually run at Lake Erie Metropark, in the bottom right corner of the map, and then do my turn-around somewhere in the center of the map, where it says Flat Rock. 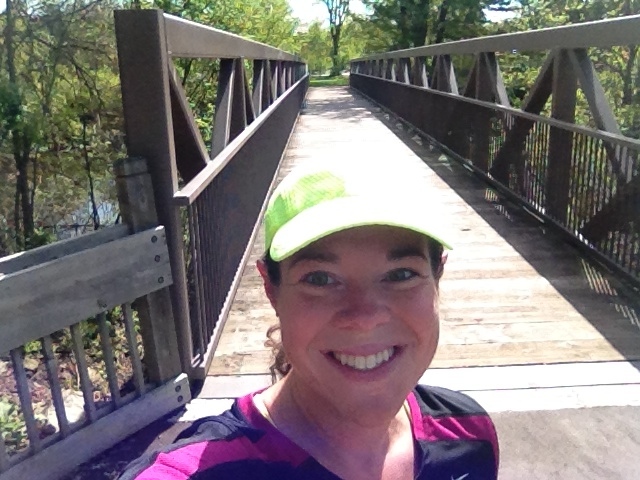 Today, I started in the center, and ran west into Oakwoods Metropark. It was a nice change of scenery! All of the rain we've had caused a couple of spots of flooding. One was so bad that I had to run through (what I think was) someone's yard to get around it. Nice, but not very interesting. This was actually my turn-around point. Right after I took out my phone to take a picture, I got a phone call from the pediatrician about Eli's appointment, so I talked to her for a couple of minutes before I started running again. I completely miscalculated the math on my turn-around point. Because I accidentally ran 0.4 miles before I started the path, the turn-around wouldn't be 5 miles in. Usually, I am great at figuring out at what point I need to turn, but today, instead of turning around at mile 5.2 (which was 4.8 miles away from my car), I turned around at 4.8. 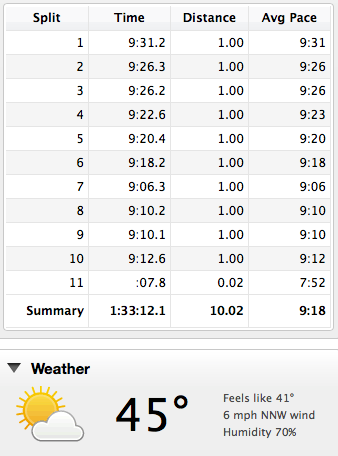 So I ended up taking 0.8 miles off of my run total. I was confused about this until I was nearly to my car, and I realized my mistake. I've never had a snail cross my path while running, so I had to take a picture. Then I picked him up and moved him off the path, so that he didn't get squashed. 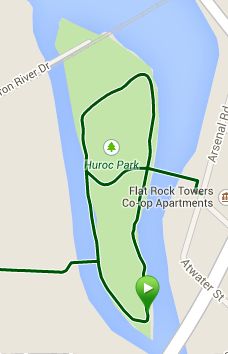 When I got back to Huroc Park, I wanted to run the infamous spot where I biffed it into the ground. It doesn't look like a hill in this picture, but I swear it is a downhill! Just before I headed out of the park, I saw a mama goose with her little goslings. So cute! I hadn't planned on running that fast (I was going to aim for around 9:45-10:00), but I felt really good, so I just went with it. It was a good run today! You had some beautiful views today! We have had the worst weather lately. I'm glad someone is getting a pretty weather day since we're not though! It's fun to brave new territory, isn't it? That's one of the things I love about running!! Glad you had a great day for it, and I hope you survived the roller rink!! i dont think i ever saw a snail! gross! haha nice run! im just like you- i dont like to run past my car buttttt i need to end on that nice even number haha way to finish it out. I'm from Michigan but I moved away almost 10 years ago-- I haven't heard the phrase 'biffed it' in such a long time. Love it! !